Basmane is a sort of city within the city of Izmir (Western Turkey), where due to its multicultural heritage and solidarity that has arisen around the neighborhood, many refugees have found a safe haven. Although poverty, unemployment, and the "urban renewal” plans of the turkish government could pose a threat to its future. Away from the large modern avenues of Alsancak, the bright representation of secular and republican city that for years gave a majority vote to the CHP – the center-left party founded by Ataturk – and from Kemeralti, the most traditional bazaar with its colors and spice scents, there is Basmane neighborhoud. The district maintains the original multicultural soul of Izmir, the city where Greeks, Armenians, Europeans and Turks have lived in harmony before the catastrophic fire of 1922. After the immigration agreement between the European Union and Turkey, over 300,000 migrants of Kurdish and Arab Syrian origin fleeing from the recent conflicts have sought refuge in Izmir, joining the Kurds from southern Turkey and the Roma already resident here since the days of the Ottoman Empire. Basmane presents itself as a tangle of steep streets that climb up the hill where the old houses are painted and some are in ruins, collapsed into smelly landfills. The upper part of Basmane, at the foot of castle of Alexander the Great, is called Kadifekale. Its illegally constructed houses – called in Turkish "gecekondu" 'overnight cutlery' – are inhabited mainly by Kurds from the Mardin area now involved in the war between the state and the PKK. The beating heart of Basmane is Kapılar, a social space now open for about a year, where every week workshops for children are held, Turkish and English language courses are offered, cultural events take place alongside dinners in the Open Kitchen, and thanks to volunteers legal or language assistance is provided. The center is also made available to the many associations that help the refugees in Izmir. The aim is to overcome isolation and foster inclusion within the ethnic groups of not only Kurds and Arabs that live in the neighbourhood, but also to facilitate encounters with the Turks themselves. It is not easy to get in touch with families that live in Basmane. After the coup of July 15 in Izmir, which here was mainly seen on television, many are afraid to talk to journalists and photographers. Nevertheless that, the multicultural and inclusive spirit of Basmane remains strong and represents a light of hope in the middle of a turbolent time. 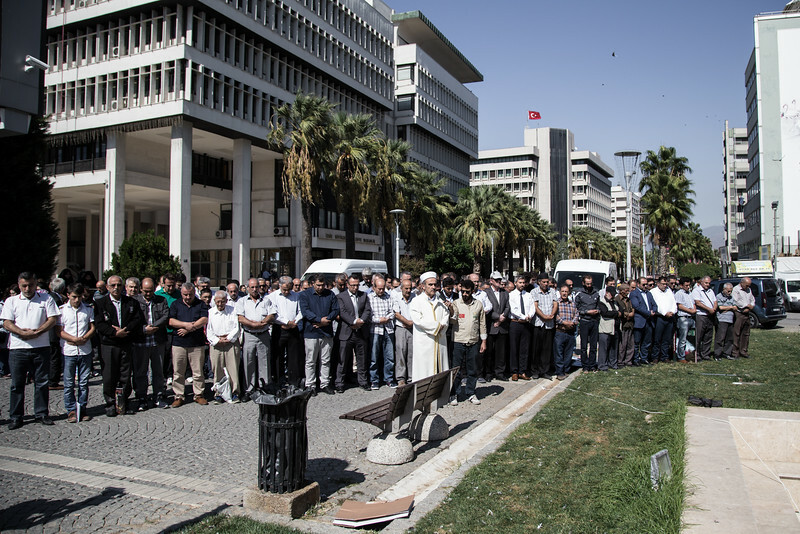 Some Syrians and Turks pray togheter oustide a mosque in central district of Konak, Izmir. The pray was organized in protest aganist the bombing of Aleppo, Syria.